September is National Literacy Month. And who better to represent it that mischievous monkey Curious George. Curious George has been around many incarnations since WWII when he was "born." His creators, Jews Margaret and H.A. 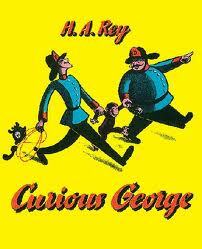 Rey, escaped Nazi occupied France on homemade bikes with the manuscript for Curious George hidden. That adventure was the perfect introduction to nosy, lovable monkey. Here are free printable Curious George coloring pages, worksheets, lessons, activities, crafts, games and even a Curious George birthday party theme. Here is a link to the parent site of Houghton-Mifflin Books, publisher of the original Curious George series. You can print free Curious George worksheets and lesson plans on reading, phonics,writing, music, handwriting, math, spelling, vocabulary and grammar. Here's another free printable Curious George activity booklet with worksheets for older kids. There are lots of Curious George coloring pages to print. There are also puzzles, word searches and games based on transportation in Curious George books (bike, boat, bus, car, space ship and more). Here's a link for free printable Curious George themed birthday party supplies. The kit features games, crafts, puzzles, name tags, Curious George mask and more. Here are gobs of free printable Curious George TV show coloring pages. PBS Kids features this beloved cartoon, with a slightly updated version of George and all new adventures. Coloring Book Info has 64 more Curious George coloring pages to print--all free! Cut them out and use for lesson plans, games, puzzles, crafts and rainy day book based fun. You'll enough free printable monkey fun to satisfy your inner primate! Reluctant and emergency readers will love exploring books with George!